This book tells how God brought profound healing into Scott Blackwell's life. But it is also the story of Scott's search for what the Bible teaches about physical healing, in this life and the next. Many Christian pastors make strong claims today about God's promise to heal all our physical illnesses. What are we to make of these claims? What does the Bible actually teach about healing? Scott's examination of these important issues is personal, warm, practical and often funny. But it is also clear, thorough and compelling in its presentation of the Bible's teaching about healing. Healed at Last offers truth, hope and encouragement for everyone who longs to be healed. 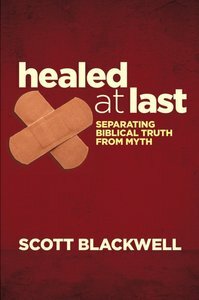 Customer Reviews For "Healed At Last"
As someone who has struggled with mental illness for a long time - and who has prayed for healing, been anointed with oil and prayed over by the elders of our church - and not been totally healed, I am always a bit weary of the name-it-and-claim-it books on healing. I saw this in store, and it straight away stood out. The reason it stands out is because it focuses on the healing that is most important - that we as Christians have been brought from death to life, spiritually broken to spiritually alive and raised up with Christ. We are new creations, still groaning in life under the Fall, but remade for the new heavens and new earth. In this sense, we are fully healed in all the areas we most need it. Yes, we can pray for healing of our minds, bodies etc. These are debilitating. But even if we were healed of our debilitating illnesses, they wouldn't be enough if we were not born again, made new in Christ. This book honours the pain sufferers feel, whilst setting our minds on things above - where we have hope that is an anchor for our soul. Refreshing, grounding, hope-fulling.